After two atomic bombs “Little Boy” hit Hiroshima on 6th of August 1945 and “Fat man” hit Nagasaki on 9th of the same year the role of Japanese military was completely transformed. For more than half a decade Japan has to re-organize itself to find a position in World stage. It is such a challenge for a country that its military was upside-down changed. Before World War II Japan had strengthen its military power. It was the result of its forcefully country opening by United State (see the “Kurofune-Black ship” incident in July 1853). In the end Japan started war in Pacific on 7th December 1941 by attacking United State Naval Base at Pearl Harbor. Japan or Japanese Empire at that time gained control most of Southeast Asia countries, however, even the greatest army couldn’t fight against atomic bomb. Japan had to surrender to the Alliances after Hiroshima and Nagasaki were bombed. Japan had signed unconditional surrender treaty on 15th of August, same year as when their cities were bombed. And the Alliances, lead by United State, had taken control of Japan. At that time Japan was not only lost the war they also lost the one of the most important factors that ensures its sovereignty, the right to have military force. Japanese army was disarmed and dissolved. No further accumulation of military force was allowed. All Japan had left was the JSDF (Japan Self-Defense Forces – or Jieitai for Japanese people), a smaller amount of military forces that could only capable for protect itself. Section 9 of Japanese constitution, drafted by US, stated that Japan cannot use its troops in conflict and cannot participate in any war. That makes JSDF officers never really have a chance to fire a gun in real combat situation. Furthermore, JSDF’s military exercise mostly done with computer simulation. In case of any treat should happen, United State will provide protection for Japan. 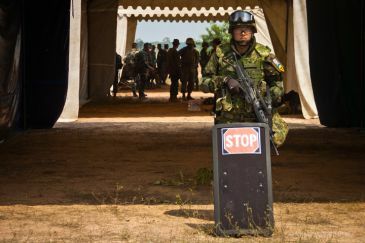 By this absolute law prohibition and no necessity to use force in conflict, JSDF’s role turned its focus to protecting its country and aiding in disaster relieve. This was a great opportunity for Japan to reduce its cost on military so that they could spend every single Yen on developing the country. Japan had stepped into one of the most powerful economic countries, same as German which also lost the war. They could even surpass those countries that took side with the Alliances and had won the World War II. However, Once Japan had stronger economic, the want to increase their action and position in the World level occurred. In 1992 Japan began an attempt to pass a new bill to allow its JSDF to participate in UN relieve mission. From 2004 Japanese parliament passes 3 more bills that allow the government to intercept or counter attack any treat, especially from North Korea. Nowadays, Japan realizes its limitation and capability of the treat defense. It is the result of North Korea hostile act against Japan. In 1998, North Korean fired its test missile across Japan which later landed in Japan Sea. North Korea also still possesses and develops around 100-200 nuclear weapons that could cover all islands in Japan territory. The fact that North Korean possesses chemical and nuclear weapons is totally affecting Japan. By its constitution that prevent JSDF from using forces, when North Korea fired its missile cross over Japan territory, the Japanese Government couldn’t do anything about it. All the Government could do is to wait for supporting from United State.